On May 5th and 6th . Team Michigan will try to defend their title on the mighty Sagnasty river in Bay City, Michigan as team Ohio and team Indiana and friends will attempt to become the new “Champions of the Midwest”. After attending the SECC Thomas talked to me about wanting to invite the new friends he made on the East coast and the Old ones he had made in Texas to the regionals. So for 2018 Michigan will be Taking on 2 teams. East and West...The East team will be headed up with team Ohio and Captain Vince Shiflet. Ohio members who attended last year will get 1 week to sign up. Next it will open up to the rest of Ohio for 1 week before it goes open to ANY other state east of Ohio. The west team will be captained by Amos William Behanna and Indiana members who participated last year will get 1 week to sign up before it opens to the rest of Indiana before it opens up to the other states...I will be adding more weigh Marshall and' Marshall’s will receive free entry It is that time of year again. Sounds like fun. 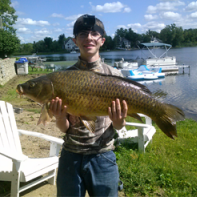 I've always wanted to fish the Saginaw River for carp but I've never gone there even though it's only an hour away. It would be great to have ya ...it is a blast! Do I have to sign up? Does it cost money? Do I have to be a certain age? Do I have to be a CAG member? I have no idea how it works. Did you get your questions answered, via PM or otherwise? I dont know why i didn't get notifications on this post activity until today......No age requirement, must be a CAG memeber at time of event. Either by full memebership or trial membership. Membership and regionals entry are purchachesd through the CAG store. PM me please i will get you added to the Michigan Facebook page. $ 20 to enter regionals 100% goes to prizes and awards. We are also having a social meeting on Sunday Feburary 25th at twin peaks madison heights 1pm. In the CAG store under events. Will be looking forwards to seeing you on the squad.